SurveilStar Agent should be deployed to computers that are required to be monitored and controlled. The Agent can be installed in silence mode and run in stealth mode. There are 3 ways to deploy SurveilStar Agent to computers: Direct Installation, Remote Installation, and Logon Script Installation. 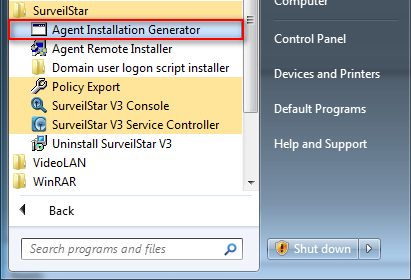 There are three ways to install SurveilStar Agent. Adopting the Direct Installation method, you need to install the Agent one by one following these steps. On the desktop of the server, click 【Start > All Programs > SurveilStar > Agent Installation Generator】. Step 3: Double-click the setup file to install the Agent. On the desktop of the server, click 【Start > All Programs >SurveilStar > Agent Remote Installer】 to start the installation. By default, SurveilStar only scans computers from the server’s network segment. If you want to extend the searching area, go to menu 【File > Scanning Settings】, and specify an IP range. All computers available for remote installation will be listed with host name, domain name, operating system, IP address and install status, as showed bellow. Tick the checkbox before the computer host name that you want to install the Agent on it, and then click the menu 【Operation > Install】 to start remote installation, or click the install icon alternatively. During installation, the administrator ingin and password are requited if the current logon session is not administrator. If the target computer is protected by password, you need to provide the administrator name and password of that computer to proceed the installation, or the remote installation would fail. View the Remote Installation Logon Dialogue Box below. (2) The admin account is not shared via network. On the desktop of Windows, click 【Start > All Programs > Accessories > Command Prompt】, input the command line "net share" , and you will see if the ADMIN$ folder is shared. Below is an example. If the ADMIN$ is not listed, you can input "net share ADMIN$" to activate the account sharing. Below is an example. (3) There is no shared folder in the target computer. Even though it's remote installation, there should be a file folder that can be used by remote user to store the Agent program. Please check any shared folders functions is available. If not, please try to share a folder to invode this function. For example, right click a folder, select 【Properties > Sharing】. Then select 【Share this folder】. Input share name and define permission. Click 【OK】 to invoke the shared folder function. 1. Remote Installation only works on Windows NT4.0/2000/XP(X86/X64)/2003(X86/X64)/2008(X86/X64)/Vista(X86/X64)/Win7(X86/X64) systems. If you needs to install agents on Windows 9x/ME, you have to use Direct Installation method. 2. Remote Installation method does not 100% guarantee because it can fail sometimes due to the Windows NT local security settings. When Remote Installation fails, the best way is adopting the Direct Installation. If you have followed the above checking and fulfilled the requirements, but still failed, we would recommend using Direct Installation method. To create such agent, please refer to Direct Installation. The Agent setup file should be saved to the Script Manager folder as described in Step 2.